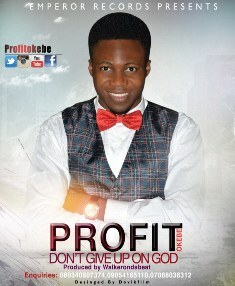 Profit Okebe is a graduate from the Benue State University of Nigeria, where he studied Business Management. He is an anointed, passionate and seasoned worshipper of God, wired to serve the body of Christ through spiritual songs that encourages and stirs up your passion and hunger for more of God. According to him, “Don’t Give Up On God”, is a song that came out of brokenness. A point where everything seemed not to be working, then I heard in my spirit, “Don’t Give Up On God”. Minister Profit Okebe currently resides in the Federal Capital Territory of Nigeria. His passion is to see humanity living with the mentality of eternity. Thanks for sharing your Interest! Back to Home Page Enjoy Your Stay!!! NgospelMedia - The No. 1 International Urban Gospel Media Website © 2018. All Rights Reserved.